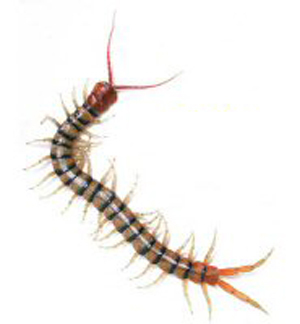 I am flat, reddish brown in color and usually around 1 inch in length. My first pair of legs are modified venomous jaws that I use to catch other insects. If you pick me up, I may bite. I have a single pair of legs on every segment of my body. I use my venomous jaws to catch and eat other insects, stunning or killing my prey with the poison. I prefer dark, damp environments and you will find me under leaves, bark, and logs or in your basement. I am most active at night unless I am disturbed in my hiding places. I go through 2 stages of development: egg and small adult. My egg is laid in the soil during the warm summer months and the females care for my egg until I hatch. Adult centipedes will protect my egg nests. When I hatch I look just like a small adult. To grow I shed my skin which is called molting, adding a pair of legs each time I molt. I can live up to five years.